Do You Need Warm Up Exercises? It’s tempting to skip a warm up before you work out. We’ve all done it. It takes time and it just doesn’t feel like you’re getting that much accomplished. Are there any benefits to warming up? What should your warm up exercises look like if so? Warm up exercises are done to improve performance and reduce the risk of injury. One meta analysis found that warm ups improved performance on 79% of tested criteria. Improvement was found specifically in cycling, running, swimming, vertical jumps, long jumps, agility, softball, basketball, bowling and golf. Improvement in the studies analyzed ranged from less than 1% to 20%. The evidence around injury prevention is mixed, however one review found that warm ups do indeed reduce the risk of injury. So it appears that warm up exercises can be beneficial. But what should you do during your warm up? Studies show that the warm up should be between 5 and 10 minutes. One review found that static stretching (holding stretches) reduced performance in the majority of studies. Dynamic stretching (actively moving the muscle through the entire range of motion), however, tended to increase performance. Dynamic stretching of anywhere between 90 seconds and 10 minutes can improve performance (with more typically being better). The researchers recommended only using static stretching if your warming up for a sport like gymnastics that requires a lot of flexibility. Even in that case, you should limit your time using static stretching to less that 90 second per muscle. Studies have found consistent decrements in performance when static stretching for 90 seconds or more per muscle, mixed results for 30 to 60 seconds, and trivial decrements when static stretching for 30 seconds or less. Do warm up sets before lifting weights (especially when lifting heavy weights). Finally, the exercise choices should be sports specific. So, if you’re about to run, starting out walking and/or jogging would be a good choice. Avoid the temptation to skip warm ups. 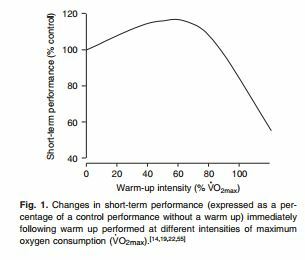 Warm up exercises ideally should be 5-10 minutes at 40% to 70% VO2max. Stretching should be dynamic and exercises chosen should be specific to the exercise or sport you’re about to perform when possible. Good luck! Woods, Krista, Phillip Bishop, and Eric Jones. “Warm-up and stretching in the prevention of muscular injury.” Sports Medicine 37.12 (2007): 1089-1099. Don’t Make Decisions When You’re Stressed!